Aadhar is one of the biggest project of the central government of India for national identification number. It is unique identity number allotted to each citizen of India, which remains same in each part of the country for that particular person. Aadhar card is going to be a vital document in coming days for all the services related to government. ,Not only for government related services but also it is going to be a strong proof of identity for any kind of service in non-government sector too. The work of Addhar card issue is going on on large a scale by unique identification authority of India. So many agencies are involved in this project. In the last article we discussed how to enrolled for Aadhar card. In this article we are going to discuss what is process to update aadhar card data. Anybody can change the information of the Aadhar card like Name, Address, Gender, Date of Birth, Mobile Number and Email ID. Mobile number is compulsory to start the process of updating Aadhar card data because password will be sent to the mobile number. If you haven’t registered mobile number, please visit to the nearest Aadhar center to update data. If have one than you can follow the process given here. B) Enter your existing Aadhar number as well captcha text which asked to enter below it. D) on the next screen, select the option you want to update.You can choose multiple options too.Those field will be updated not only in English but also in local language too. E) Review the entered data for final submission. F) Click to submit. After clicking on submit button Update Request Number (URN) will be generated. Note down the same reference number for future communication on this update issue. User should keep in mind that if you are going to update date of birth , which is verified, can be changed only once here. 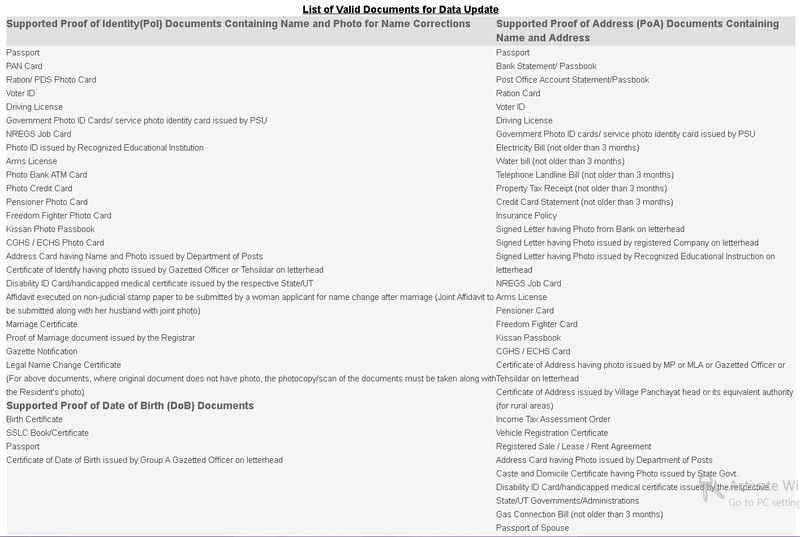 For whichever field you are asking for update the relevant document should be submitted otherwise it will not be processed. 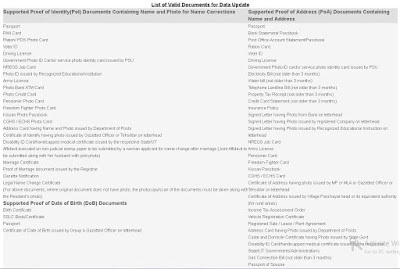 For each kind of update what kind of proof of documents are required are given below. D) Fill up the form and send it to the any one address of given below. In this process you, need to attach proof of all required documents.